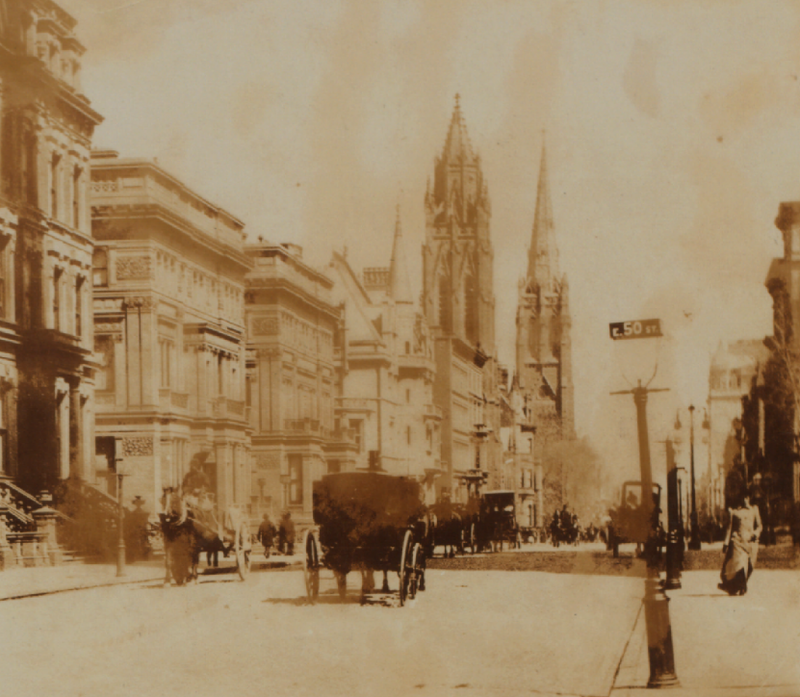 A hack rolls along 5th Avenue in 1881 (detail of a photo held by the New York Public Library). I know a very nice fellow who drives a hack for a living. It is his own vehicle, and he naturally takes a pride in it, as he does in his horses, which are always neatly groomed. It is his own choice that he works at night instead of daytime. He is something of a student of human character like myself, and he avers that the pursuit of the occupation is much more entertaining at night than in the garish, vulgar day. And then again he makes more. There is always some eccentricity about people who take carriages after midnight, which is just as apt to find expression in a liberal system of payment as in any other manner. I must be very careful to explain that my hackman, with whom I have just had a long talk, must not be confounded with those disreputable fellows who stand in with burglars. He is an honest whip, and during all the time that I have known and hired him I have detected nothing wrong in his character. 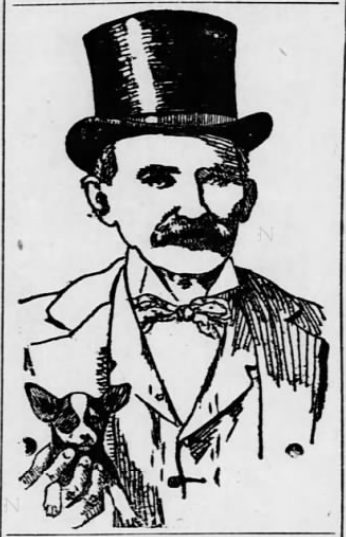 I first made his acquaintance when there was an all-night eating and drinking saloon in the basement at Clinton place and Broadway. His hack stood outside. He knows all about the disreputable members of his fraternity, however, and has told me many a story of their collusion with thieves. The burglar has frequently escaped owing to a hack being in a dark alley ready for him to jump into and bid defiance to the pursuing police. There was a case about two years ago where a robber got away successfully with his swag owing to fleet horses, and amused himself furthermore by firing a revolver through the back window at the policemen. The Jehu of my acquaintance haunts the railroad ferries, and generally gets a fare. One of the most mysterious that he ever had he picked up at Desbrosses street at 4 o'clock in the morning. She was a young girl from Philadelphia who took his carriage and told him to drive anywhere until daybreak. She had no baggage.
" ' But it is cold and damp, Miss. Had you not better stop at a hotel, or with some friends?' I asked her.
" So I did. I remember that it was down near the Battery I had gotten to by sunup. It was a Spring morning and the birds were singing, while the waves in the bay had just begun to glisten. I got down and looked in. She was dead! stone dead, with the revolver still in her hand and a purplish hole in her temple. She had so arranged a shawl and her handkerchief that the blood had not soiled my carriage a bit If it had I would not have been ruined, for she had pinned a $50 note to the lace of the coach, with a penciled line on a piece of paper, saying it was for me." " And what did you do ?" " I drove her to the Morgue, wondering all the while how I never heard the report of the revolver. She must have done it during the clatter made by some market wagons from Long Island that I got mixed up with. After leaving the body I informed the police. Nothing was found upon her, and the chief of police in Philadelphia could get no trace. They buried her up the river." New York City hacks wait in front of a 5th Avenue hotel in the 1880s (detail of a photo held by the New York Public Library). Cabby tells curious tales about the balls at the Academy. He says that he is frequently told by the gentleman, after the lady is assisted into the vehicle, to drive up to Central Park at a walk. He has then been requested to drive to High Bridge, or anywhere else. Sometimes on these occasions the most violent scenes take place, and one night the woman screamed to him for assistance. It was at a lonely place on the Kingsbridge road, and about 3 AM. He halted his horses, jumped down and opened the door; the young woman, who was costumed as a page beneath a pink domino and mask, springing out almost into his arms, begging him to protect her.
" That I certainly would. I then asked what was the matter, but got no satisfaction. She cried and he laughed. It was easy to surmise, however. I ordered him from the carriage, and then put her back, she telling me where to go. I left him standing in the road in his full dress suit, calmly smoking a cigarette ! The lady lived in a swell house near the Windsor. She made me come around the next day and gave me $10, although I had been paid for the night's work by the Lothario in the dress suit." " Have you never gotten in trouble about these mysterious night fares?" " Once only. A young man picked me up on Broadway and took me way over to Hoboken. We stopped at a house from which a young woman, all muffled up, and so weak that she had to bo carried, was brought out. I suspected something wrong then, but I was younger than I am now and the night was wasted, and I resolved to stick it out. They had me drive to a place in Grand street—a disreputable-looking house, with a light burning in the second-story window. I got a glimpse of the young woman's face as the young man and an old lady helped her out. It was pale as death. She turned her head, and seemed to look right at me as if asking for aid. An old wretch in a skull-cap came to the door with a lamp.
" It was an abortion case, of course. The girl died, and when they advertised for the hackman I drove down and gave myself up. I believe that the old man got ten years. The young one jumped the town, and I never heard of his being caught." He told me a great many more curious things; how an old gray-bearded man took him at Courtlandt street ferry once, and it was a young, smooth-faced fellow who got out at the Grand Central Depot, where he had been told to go. On another occasion a veiled lady, carrying a baby, hired him to catch the midnight Washington express. He caught it, but when he opened the door the woman was missing, and the baby, tucked up in a corner, was all that remained. He turned it over to the police. The woman must have jumped out while he was going at full speed. In the case of the old man, my cabby thinks he was a criminal, fleeing from justice, who used the cab as a dressing-room in which to remove his disguise. Despite the well-worn analogy of the early telegraph as a “Victorian internet,” the story of the intra-urban telegraph—which might be called a “city-wide web”— has been almost completely neglected. 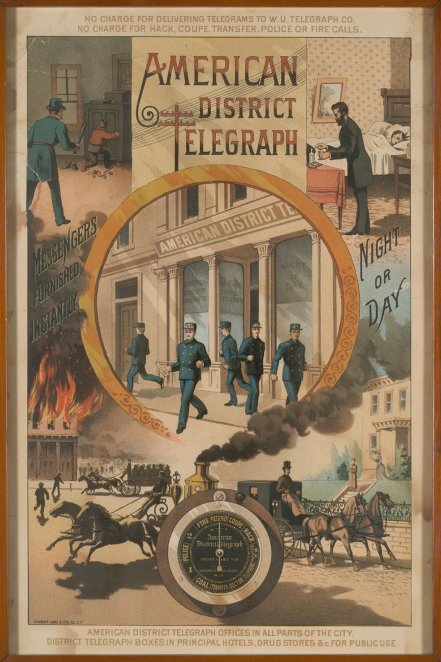 In the 1870s, the American District Telegraph Company developed a dial-based interface that simplified the use of the telegraph, making possible a network connecting the businesses and homes of wealthy subscribers to a city of services. The interconnectivity provided by the urban telegraph promised both to transform urban space in the bourgeoisie’s image, and to professionalize the occupations—messengers, firemen, police, and hackdrivers—whose services were ordered through the telegraph callbox. More than simply a communication device, the urban telegraph promised to alter the class and gender constellations of advantage and disadvantage relating to public space and mobility. This paper will focus on how the urban telegraph realigned advantage and disadvantage for both customers and workers, in particular though the provision of dispatched hack service. Telegraph dispatch increased the disadvantage of working-class hackdrivers vis-a-vis their wealthy customers, by constraining drivers’ movements, behavior, and control over the negotiation of fares and acquisition of passengers. At the same time, the urban telegraph brought new advantages to women customers, whose access to public space and mobility were increased, though not without controversy. Although the urban telegraph was quickly supplanted by the spread of the telephone, its story provides insight into the ongoing search for technological fixes for the complicated class and gender politics of urban space.